Dispelling the Myths and Untruths About the 351M/400. The 351M/400, or 335 Series engines are, in my opinion, one of the most overlooked and under-rated Ford engines ever made. 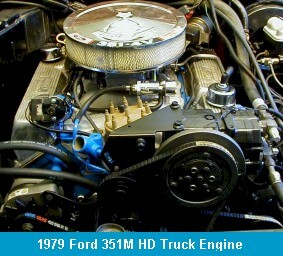 Just talk to any Ford enthusiast about these engines and chances are they will not have anything kind to say about it. However, having owned a '79 Bronco with one of these engines for 14 years, I believe they are wrong, dead wrong about these engines. After all, any engine that can take the kind of abuse I've put my 351M through and still last almost 200,000 miles can't be all that bad! I even know of a 1981 F-350 that had a 351M that went well over 400,000 miles without a rebuild. That's right -- FOUR HUNDRED THOUSAND MILES!!! So, as we all know that actions speak louder than words, I decided I was going to take it upon myself to prove them all wrong! So, I'm writing a series of articles to demonstrate how to build a 351M/400 that will perform as good as any other Ford engine out there. All of these engines were loaded down with primitive, first generation smog controls throughout out their entire production run. Ford never produced a "high performance" version of this engine. All 351M/400's were only available with a 2BRL carburetor. Most 351/400's were fitted with severely retarded timing chains and camshafts to help meet stringent pollution control standards. The 351M/400 engines have "thin wall" castings and can not be safely over-bored beyond .040". All 351M/400's have problems with cracked blocks and heads. All 351M/400's have crankshaft oiling problems because Ford enlarged the main journals from 2.75" on the 351C to 3.0" on the 351M/400 but did not decrease the size of the oil galleries leading up into the top of the engine to properly balance the oil pressure. It is impossible to build these engines for high horsepower due to inherent design flaws. They weigh more than the 429/460. They make great boat anchors. Now, lets tackle each of these items one by one. First, I'll address the legitimate problems associated with these engines. All "M" block engines were loaded down with primitive emission controls -- Many people have put down the "M" block engines because they are in fact loaded down with emission controls. But guess what? So was every other 78 & 79 engine, regardless of who made it! Admittedly, the "M" block had some exhaust gas recirculation features built in to the intake manifold, but this was done to eliminate all of the air and exhaust tubes that had to be added externally to the older 302/351Ws and 429/460 engines. However, if you are the kind of person that still gets upset just knowing they are there, then simply replace the factory 2V manifold with a non-EGR unit. Problem solved. Ford never produced a "high performance" version of this engine -- Actually, this is not entirely true. Ford build plenty of HI-PO 351 Cleveland's, which is very similar to the "M" block engines. The main difference between the 351C and 351M/400 are the length of the connecting rods, which are 0.8" longer on the "M" engines, the main journal size, which is 2.75" on the 351C and 3.0" on the "M" engines, the block deck height which is 1.09" taller than the 351C, the intake manifold which is about 1" wider than the 351C, and the transmission bolt pattern. The cylinder heads, the distributors, the entire valve train (except for the push rods), the water pumps, the oil pans, the fuel pumps, and the oil pumps will interchange between the 351C and the "M" engines. Therefore, there are plenty of HI-PO parts that were designed for the 351C that will work on the "M" engines. Besides, who in the world actually has factory original HI-PO parts from engines such as the Boss 302 and the 429 SCJ on their 302 or 460 truck engines? Folks, this is what the a-f-t-e-r-m-a-r-k-e-t parts industry is for! All 351M/400's were only available with a 2BRL carburetor -- Actually, I'm not so sure about this one now. It has been brought to my attention that Ford did offer a limited number of 351M/400 equipped Broncos with a 4V carburetor. However, a 4V 351M/400 is very, very rare so for all practical purposes, just about every 351M/400 ever made only had a 2V carb. However, upgrading from a 2V to a 4V carb is easy because Weiand makes a set of spacers that will adapt the much more common 351C manifolds to the "M" engines and there are plenty of aftermarket (hmm.... there's that word again) 4V manifold available specifically for the "M" engines. Problem solved! Most 351/400's were fitted with severely retarded timing chains and camshafts to help meet stringent pollution control standards -- Yep. This is true too. After 1973, Ford started putting the retarded "smog" camshafts in the 400 and the 351M had the "smog" camshaft throughout it's entire production run. But come on, who do you know that would actually put a 100% original Ford timing chain and camshaft back into their engine during a rebuild? There are many quality aftermarket cam shafts out there by companies such as Comp Cams, Crane, Wolverine, Isky, and Edelbrock. Again, Problem solved. The 351M/400 engines have "thin wall" castings and can not be safely over-bored beyond .040" -- Okay. Don't let this scare you away from "M" block engines. Ford did this to save weight. An "M" block engine is good for one or two complete rebuilds before you have to sleeve the block. All this means is that you can't over bore an "M" engine much beyond .040". As an example, when I had my engine rebuilt, the shop found that the #1 piston's wrist pin came loose and scored the block. A .030" over bore would not clean this cylinder up, so they had to put a sleeve in it. Big deal. It cost me $75.00 to fix it. All 351M/400's have problems with cracked blocks and heads -- This nasty rumor got started because there were water jacket cracking problems associated with certain "M" block engines that were cast at Ford's Michigan (Code MCC) foundry prior to March 2nd, 1977. All "M" blocks that were cast at the Cleveland (Code CF) Foundry are okay. Your 78 or 79 "M" block should be just fine unless you have a very early model 78 Bronco made in 1977 or you are working with an older 351M/400. In this case, you should check your engine casting code to make sure it is okay. The casting code on the 351M/400 engine consist of 4 digits. The first digit is the year in which it was cast. The second digit is the month (A=January, B=February, C=March, etc....). The last two digits represent the day of the month the engine was cast. 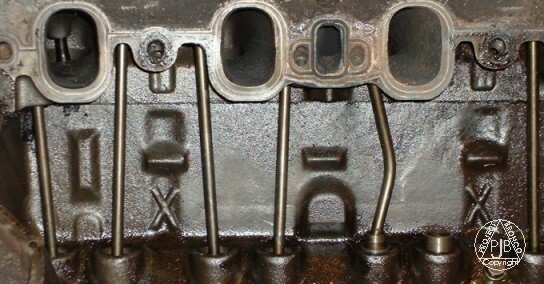 The casting code is located on the top rear face of the block right next to the oil pressure switch (See Fig. 4 below). Fig. 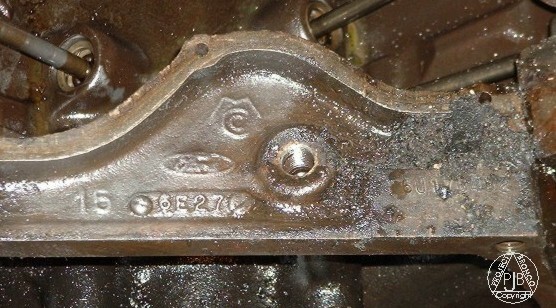 1 shows an "M" block engine with the casting code of MCC 7C01, which means it was cast at the Michigan foundry on March 1st, 1977. Fig. 2 shows the casting code off of my engine, (MCC 9B28) which shows that it was cast at the Michigan foundry on February 28th, 1979. the "9B28" is upside-down because that is actually the way it appears on my engine. Yours may be right side-up as in Fig. 1 or upside-down as in Fig. 2. I have seen them both ways. Fig. 3 and Fig. 4 below shows a 400 with the common 351M/400 water jacket crack. In Fig. 3 you can see the crack about 1" up from the top of the lifters extending about 4" to each side of the center. Fig. 4 shows this cracked block was cast at the Michigan Casting Center on May 27th, 1976 (MCC 6E27) just 10 months before the 3/1/77 cut off date. I can not stress enough just how important it is to check your block for cracks before you rebuild it. Again, you should not have any problems with cracks if you have the original 351M/400 in your 78-79 Bronco because there were no abnormal cracking problems with the heads or blocks on any of the 351M/400 engines built after 3/1/77. -- Special thanks to Jon Colman of Auburn, WA for supplying the pictures of the cracked M block in Figure 3 & 4 above. All 351M/400's have crankshaft oiling problems because Ford enlarged the main journals from 2.75" on the 351C to 3.0" on the 351M/400 but did not decrease the size of the oil galleries leading up into the top of the engine to properly balance the oil pressure -- This myth is one that most everyone, even people who like the "M" engines, hold as being fact. Some people believe that because the "M" engines have a larger journal diameter than the Cleveland engines that Ford "forgot" to restrict the oiling galleries to make up for it. Well, if this is so then why isn't the 351W rumored to have the same problems due to fact that it has the same journal diameter as the "M" engines?, Also, installing a 400 crank shaft in a 351W has become a popular "stroker kit" for this engine, yet no one is complaining about 400 CID Windsor engines throwing crank shafts! And what about all of the "M" engines out there with 200 or even 300K miles on them without a rebuild? Despite all this, some people still insist that there are abnormal oiling problems with this engine. There is even an "oiling restrictor kit" available from Moroso to supposedly "fix" this "problem". This kit is designed for high-volume oil pumps in racing applications only. From my experience the only time an "M" block may experience oiling problems on the crankshaft is if someone installed a full-competition high-volume oil pump in an engine driven on the street. I used a standard volume Melling oil pump on my engine and it has fantastic oil pressure! The only thing I can think of that may have "fueled the fire" on the "M" oiling problem rumor is the fact that this engine was installed mostly in full-size 4x4 trucks and even saw duty in many 1-ton F-350s. Many of these trucks were used to tow enormous amounts of weight back in the days before overdrive transmissions. The "M" engines were also some of the first small block engines that were now being asked to do the job previously reserved only for super heavy-duty big block engines. It is quite possible that some "M" motors may have worn out sooner than some of the older HD big block truck engines. However, I believe that the "M" engines are the only small blocks made by anyone that can even attempt to take this kind of abuse. I think the "M" engines simply got a bad rap because they were being used in applications where no small block engine should have been in the first place. In short, if you need to tow a 10,000+ pound trailer on a daily basis, then get a diesel or a HD rated gas engine. But if you use the "M" small blocks they way they were intended to be used (i.e. in a half-ton Bronco) and you don't exceed your Bronco's rated towing capacity, then you should get many, many miles of trouble-free service out of it. It is impossible to build these engines for high horsepower due to inherent design flaws -- The only possible basis I can think of that may have got this rumor started is the fact that "M" blocks have longer connecting rods for greater torque than the 351C. It is true that the 351C will rev a little quicker than an "M" engine, but the "M" engine will develop more torque, and this is exactly what you need in a heavy vehicle that is driven on the street. In other words, if you are building a 2,300 Lb Mustang, then use a 351C, if you are building a 5,500 Lb Bronco, then use the "M" engine. But just to set the record straight, there are no "design flaws" in the "M" engines that would hinder a performance build up. They weigh more than the 429/460. -- Someone must have been on drugs when they started this rumor. This is absolutely not true. The "M" engines weigh less, a lot less, than the 429/460. According to Hot Rod Magazine's Ford High Performance publication (1985), The Ford 429/460 weighs in at 720 lbs and the 351M/400 weighs in at 575 lbs. That's a 145 lbs. difference! They make great boat anchors -- This isn't true at all! Have you ever tried to push a 400 of the bow of a boat? This would not be a good picture.